Each piece of jewelry is a unique and beautiful piece of artwork designed and finished through a collaboration of efforts from Andrea Howell of Tidal Cool and Cynde Hujarski of Cynde H. Designs in Cleveland, Ohio. These 1 inch copper earrings are lightweight and beautiful for any occasion. Fish hooks are made of gunmetal. The beautiful patterns in henna designs serve as inspiration to examine the art form in great detail. Small snapshots of a much larger work of art can be seen here through the use of kiln fired decals on vitreous enamel. The process begins when a sheet of copper is cit into a particular shape, and then drilled, shaped and cleaned before it receives the first sifted layer of powdered enamel. The coated piece of copper is then placed in a kiln and fired between 1450-1500 degrees. This causes the powdered enamel to melt and adhere to itself to the copper. A second layer of color is applied on top of the first in the same way. The newly enameled enameled piece is then cooled and places in an acid bath to remove any oxides that have formed on the underside of the bare copper. It is then neutralized in water and the copper side s thoroughly cleaned. This bare copper surface is then covered in enamel using using the same steps as the front. A wide variety of colors can be produced in enamel that serve as a colorful backdrop for the intricately detailed henna designs. Small segments of the henna designs are extracted from photographic images of the larger work of art. These images are resized using software, and are printed on a special decal paper made for laser printers. The decals are cut to size and applied to the surfaces of the enameled pieces using a warm water application. After allowing the decal to dry completely, the enameled piece is then placed back into the kiln for one final firing. The timing of this final firing is critical to the outcome of the image. Too little time and image can be wiped way with water, Too much time and the image will fade or disappear completely. The optimum time leaves a permanent printed image on the enamel surface. 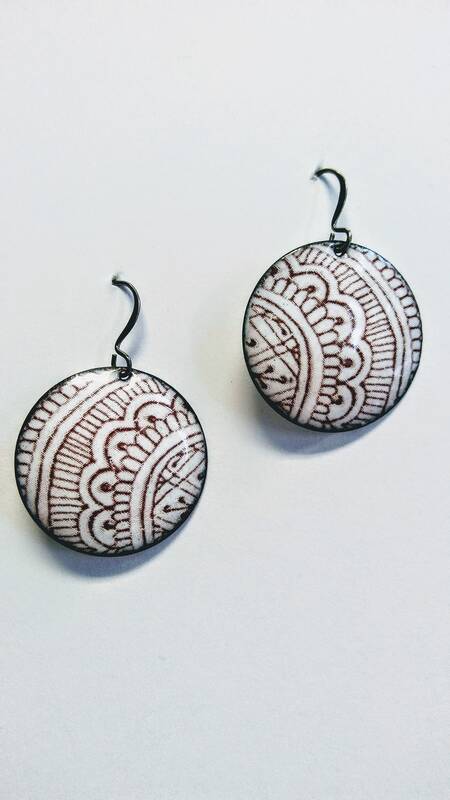 Once the enamel piece has been cooled, it can then be made in a finished jewelry piece.